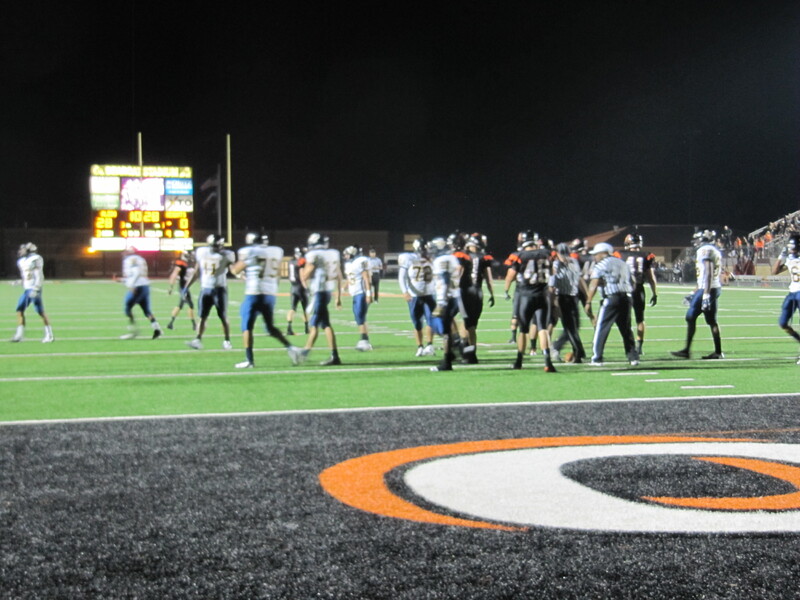 The Aledo Bearcats dominated in every aspect of the game last night defeating the Yellowjackets from Arlington Heights 45-2. All week, in fact the whole time I’ve been in Texas, everyone’s told me I should have seen Aledo last year and the amazing senior class that had led the Bearcats to three state championships. While it must have been fun to watch, I have to say that I’m more interested in watching programs that win despite not having great athletes and physical specimens. Winning with a roster full of D-I talent is one thing, but taking average kids and turning them into a great football team takes kids who are willing to commit, maturity to put the team in front of the individual and great coaching. This is not to say that Aledo doesn’t have talent, they do: Quarterback Pate Davis threw and ran the ball very well, sophomore running back Jess Anders has tremendous speed and moves, and the offensive line is quick and strong. The defense is stifling, knifing and looping into the backfield and holding Arlington Heights to under 50 total yards and just one first down in the first half. The only time Arlington Heights crossed midfield was the very last play of the game. 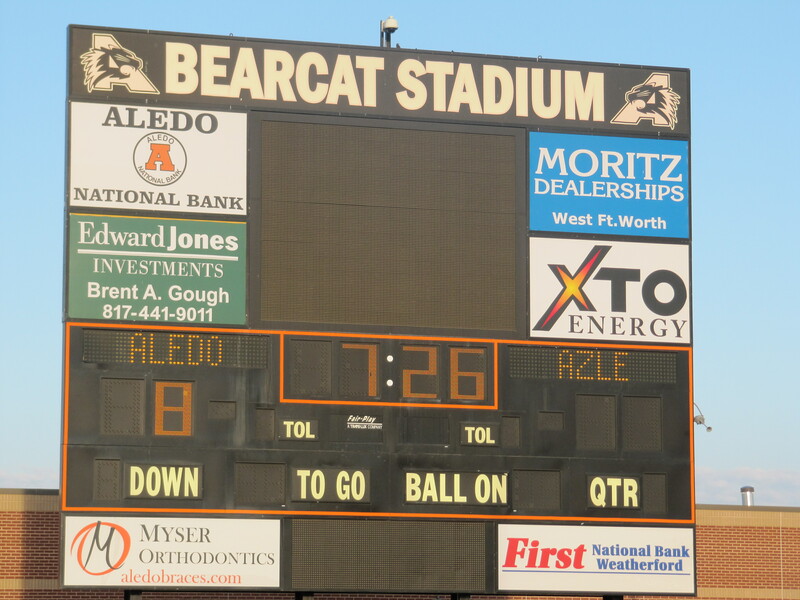 For all that, what stands out to me about this game and the Aledo Bearcats is execution of a program. Coach Buchanan has been the head coach at Aledo for 19 years and has had the Bearcats in the playoffs for the past 16. This string is a result of a great system that’s been set up by Coach Buchanan and his staff. Yes, there have been great athletes during this time, but the bottom line has been the consistency of a coach who has decided to stay at Aledo and build a program from mediocrity to a 4A powerhouse. If there is one thing I don’t like about the Texas model it is how it encourages coaches to bounce around the state by moving up the latter through multiple ISD’s. It’s good to see programs like Aledo where a coach has built a program rather than find a ‘better one’. Thanks to everyone at Aledo for my great week there. I learned a lot and thoroughly enjoyed my time with the Bearcat team and staff. I look forward to watching how they progress. Aledo is the kind of program it’s easy to hate from the outside. They have an indoor facility, a beautiful stadium complete with color coordinated seat backs, a great field house and an upper middle class student body from nice two parent families. Coaches from less affluent areas are often resentful of the advantages they feel programs like this have. People outside of Texas see places like Aledo as a stereotypical big school program with misplaced priorities; the epitome of the excess they believe exists in Texas. But like most things, first impressions don’t survive a deeper look. -The new high school was built in 2000 with no athletic facilities, the football team had to go to the old stadium on at the old HS,, now a middle school to play, the stadium was small and not excessive in any way. A separate bond issue was passed in 2006 to build an on-campus stadium. The home side of the stadium holds 5000 people and is generally full. -A plaza area was build just inside the entrance for other Aledo programs to set up booths and fundraise for their programs. -The football budget would be modest in many other states. Aledo football players must pay for their own shoes and team meals. Unlike many schools one booster club represents all sports at Aledo. -The significant gate receipts do not go to football or even athletics, but into the general fund that pays for such things as teachers salaries. 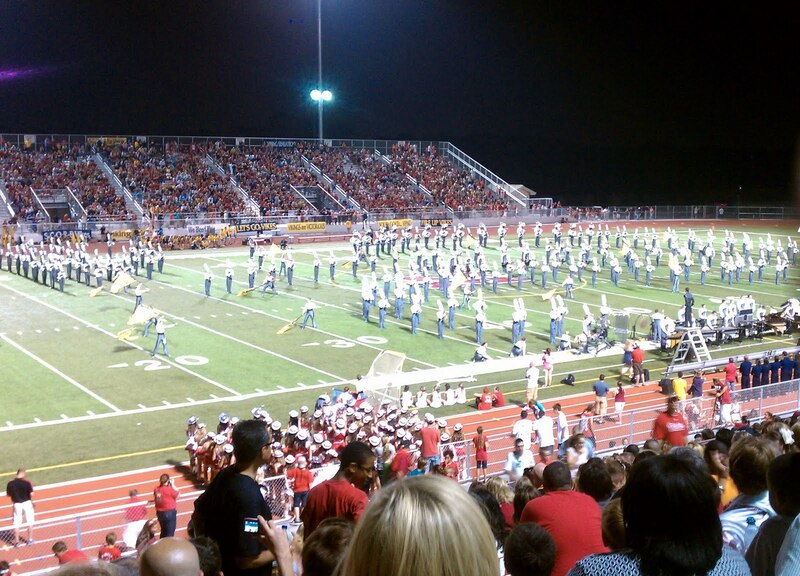 -With just over 1500 students, around 250 play football, but 300 are in the band and Aledo is well rounded enough to compete for the Lone Star Cup every year, a competition that takes into account all the athletic and academic programs a school offers. 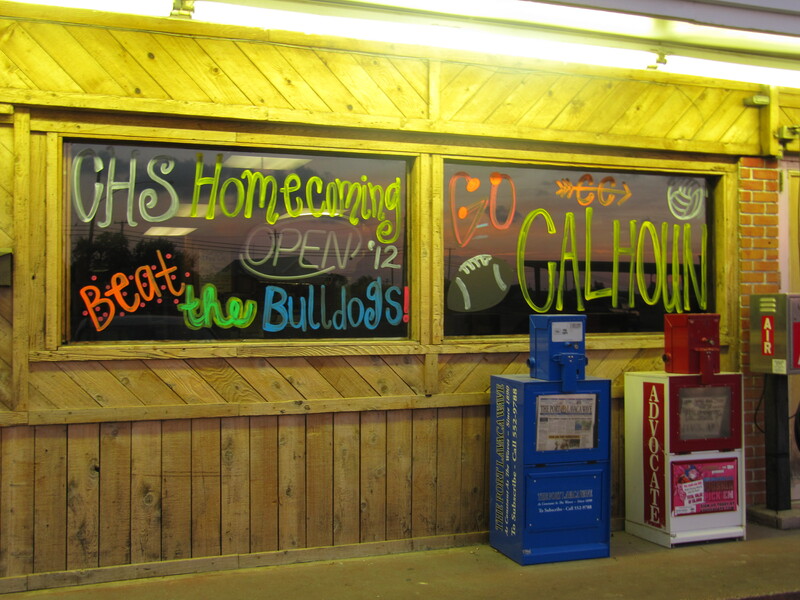 Yes, Aledo has a lot of advantages over some places, but that wasn’t always the case. The program was built up by hard work, not inherited. When Coach Buchanan took over in 1993, Aledo had a struggling 3A program with substandard facilities and a history of losing. The powerhouse you see at Aledo was largely earned not bought, and the rise of Aledo football has only helped the other programs at the school. I’ve thrown out this challenge before, but if somebody can find something wrong with this model for a quality, comprehensive high school, please feel free to write a comment on this blog. One of the interesting things about this trip is seeing the different ways of doing thing that I’ve have never even considered. Like most things, I suppose, football is full of a million little things that are done the way they are just because they’ve always been done that way. For example, 99% of the football programs in the country practice after school. As a coach, it never crossed my mind to do anything else. Unlike this norm, Aledo practices before school every day. They start every school day at 7:20 AM on the gamefield as the sun rises over the east endzone (yes, another oddity is Aledo’s east-west field) practicing through their morning athletic period. Shortly after nine all the student and coaches rush to their respective locker rooms, shower, change into civilian clothes and begin their school days. There are several advantages to morning practices; most obvious is staying out of the hottest part of the day. The past two days were some of the first since I’ve been in Texas where the heat wasn’t something to overcome and fight through. At eight in the morning the sun beating down isn’t an issue. The start time also allows some coaches to focus on the JV and freshmen afterschool while the varsity meets with other coaches to fine tune, lift weights and work on special teams. Hard to prove, but I’m also guessing the boys are more focused and fresh in the morning than after sitting in classrooms all day. 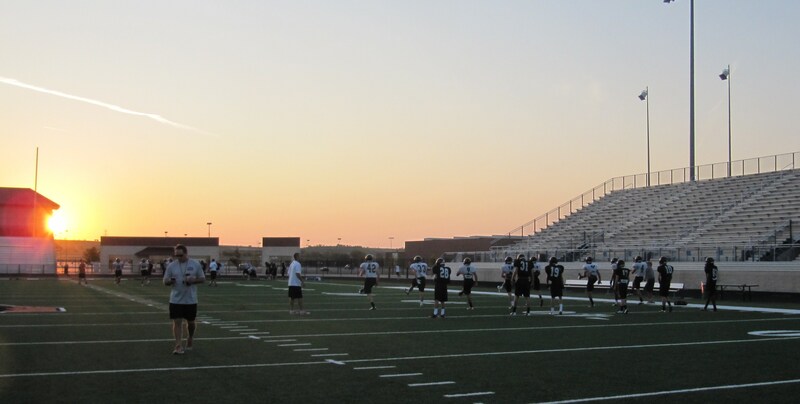 The uniqueness of Aledo’s practice procedure doesn’t end with the early start time; the atmosphere is relaxed yet focused and crisp. Over the stadium loudspeakers a mix of a dozen country and classic rock songs plays in a loop, small groups of players stretch in circles around their position coaches who use this time to reinforce their teaching. The scoreboard is preset for different intervals anywhere from 2 to 12 minutes specific to the needs of the coaches. 2 minutes for water and transition, followed by 9 minutes for inside hull vs. the 5 minute uniform segments most programs use to organize their practices. The tempo is quick, without being overly physical. Technique is stressed, filmed and critiqued in afterschool film sessions. Everywhere I’ve been, people have wondered about how Aledo would be in the post Jonathon Gray era. I know he’s an outstanding player and I’ve been told, a great young man. But when players like him come and go people seem to forget that football is the ultimate team sport and the system that Mr. Gray excelled in is still plugging along. Aledo’s practice organization is a small part of this system and judging by what I’ve seen and their non-district play, the Bearcats are still a team to contend with. The days when teams beat up on each other all week during game week practices are mostly gone. It used to be common to hold live, full-contact scrimmages once a week. Some programs are more physical than others, but it’s generally accepted that cutting your own players and tackling to the ground are too risky and draining to be done during the week. How teams practice means that despite watching a team all week, I’m often surprised by what I see Friday night. Last week in Port Lavaca I wasn’t prepared for the physicality of the Calhoun team and this week at Stamford, I again saw things that didn’t show up in practice. Stamford was coming off a very convincing win vs. Merkel in week two. This is always a dangerous situation for a good team early in the season. Kids sometimes figure they can just show up and win based on the colors they wear and past success, forgetting the opponent has something to say about this. For a team that I thought was very sharp at practice during the week, the Bulldogs came out kind of flat during the first half last night vs. Colorado City. They made some mistakes I hadn’t seen during the week, running poor routes, misaligning and putting the ball on the ground when on offense. On the plus side, the Bulldogs showed more raw football talent than practice had made me expect. Quarterback Hagen Hutchinson was picked as Texas Football Magazines 1A coverboy and preseason all-state quarterback for a reason. He makes good decisions and throws a great ball, but what was most impressive last night was how well he runs. He has the ability to create a great play out of nothing with his moves and speed. The Stamford receivers are better than I’d expected, they have good hands and run well. The Stamford offense relies on screen passes out of a single back set. A quarterback who can throw or run and receivers who get yards after the catch makes this team very hard to defend when they’re executing. After leading only 13-6 at the half, the Bulldogs pulled away and put away the game in the 4th quarter beating the C-City Wolves 34-14. The Stamford coaches seemed a bit down about the performance. This is a team that has very high expectations and to reach them they’ll have to clean some things up. That said, Colorado City is a good 2A school and winning by 20 points while not playing your best football is not a bad place to be. I expect Stamford will continue to improve and I hope to see them again in December. I want to thank all the coaches and everyone else that was so helpful during my week in Stamford. From what I saw, this is a great school and a town that supports and takes a lot of pride in ALL the schools activities. Locals wanted to talk to me about the nationally renowned ag. program as much as the football team. I’m in Fort Worth tonight getting ready for my week with the Aledo Bearcats. Check in next week. Stamford is the first of three schools I’m working with where the coaching staff is actually smaller than the staffs I worked with in Reno. 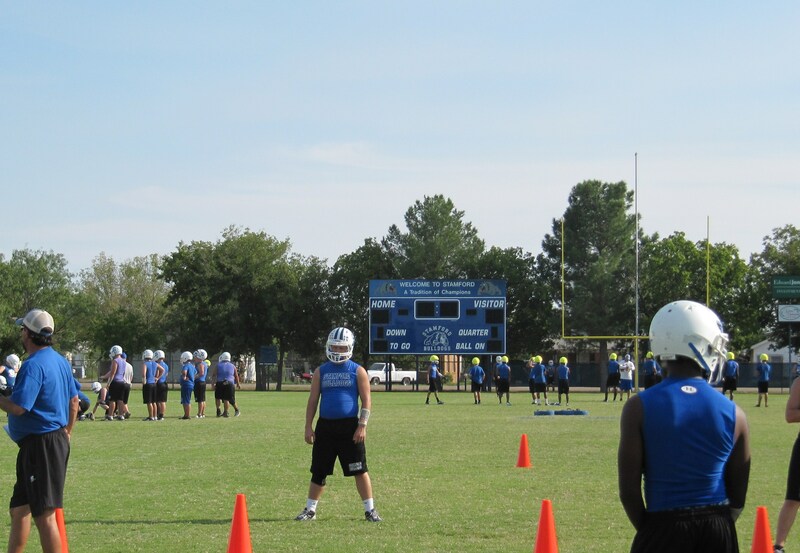 Stamford has only seven coaches, however, as with the bigger schools in Texas, coaches at Stamford are all teachers and all work with the football players two athletic periods every day. This is the biggest difference between the Texas system and the one most of the country uses; mostly volunteer coaches with no regular athletic period where the team works year around on football skills. I can’t overstate the difference it makes to have a staff made up entirely of educators, coaching as part of their profession rather than as a hobby. Watching practice, it’s clear the model works as well with a small school as with the bigger ones. One area that the small schools are more in line with the rest of the country than the larger Texas schools is just how many things the coaches here have to do. This week, I’ve seen the seven Stamford coaches lining the football field, doing laundry, and acting as trainers for their program as well as coaching all five of the Stamford football teams (7th & 8th grades, freshmen, jv & varsity) For all that they are still a lot better set up than most coaches from the other 49 states. Unlike most places their extra work for the football program is recognized, appreciated and built into their teaching schedule. The Stamford kids are not especially big, fast and many don’t look all that athletic. This is what you get when virtually every male student in the school is on the football team. What they lack in ability they make up for with hustle, reps and execution. All week watching practice I have seen very solid fundamentals, good stances, few alignment mistakes, good routes, good passes, the ball hardly ever is on the ground and despite playing both ways, almost no confusion about assignments. In short, they do all the little things well and this adds up to a lot of wins. I’m guessing this isn’t a team that beats itself very often. From a coaching standpoint it’s truly amazing to see how much can be done with only seven good coaches in a system that allows them to do the job the right way. It’s kind of exciting to see this town getting ready for the game tomorrow nights. Stamford Bulldog flags are hanging everywhere and everyone in town seems to be wearing blue and white Bulldog tee shirts. Everyone I’ve spoken with tells me about the pride this town takes in the team and the wonderful support all the Stamford teams get. I’m really looking forward to seeing what it all looks like tomorrow night. 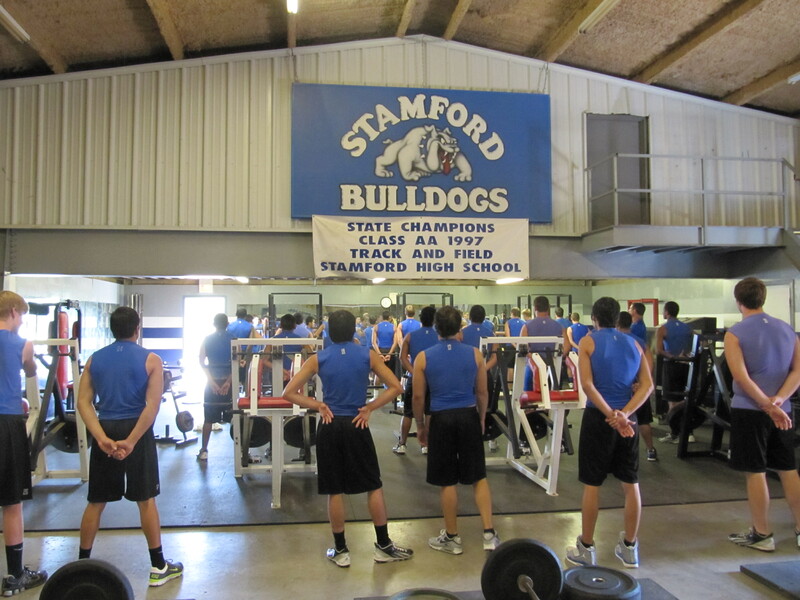 Stamford is a school with only 180 students, out of less than 100 male students, 83 play football for the Bulldogs. Today I spoke to a Hagen Hutchinson who, in the spring, juggles 5 different activities. He shows up before school to get his weight workout in for football, then to school and a fourth period athletic period for track, then to Ag. Club and more classes. After school, he goes to baseball from 4 to 6. At 6, it’s on to the golf course to work with the golf team. All these programs are successful and Hagen is a 4.0 student. My understanding is that this is not all that unusual at Stamford. Stamford High School is a great example of a small school that takes pride in well rounded kids, but it’s not the only one. All the coaches of the programs I’m working with encourage and even demand their football players be involved with other activities. The practice organization at Stamford is impressive; with the freshmen and JV to alternating between working on their stuff and running scout for the varsity. Transitions are very quick. Coach Hutchinson’s staff has been together for years and they basically use the same practice formula every week. The only change is the scout information they plug in each week. With only seven coaches this coordination is very good, and you rarely see anybody standing around. Coach Hutchinson reminds the team regularly that the pace they keep during their practices also acts as the conditioning and the kids move quickly. I really like the no-huddle system Stamford uses. 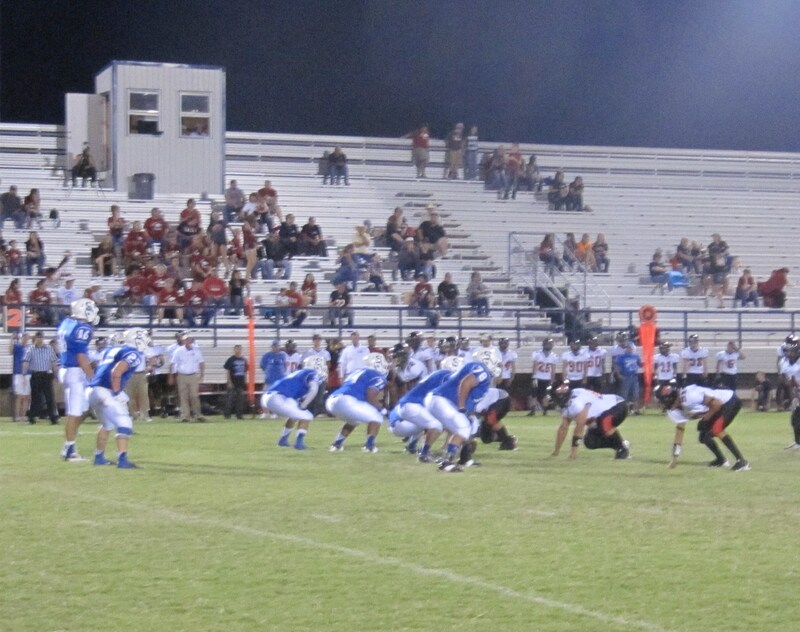 The system gives the bulldogs several advantages over huddling teams. 1) More efficient; More reps in shorter time. 3) Playcalling must be streamlined to allow calls to be made on the line. 4) Defense often can’t substitute. 5) Allows offense to dictate the pace. Stamford has been running the spread offense for the past four years. Implementing a new offense is the most significant change a program can make short of replacing a coach. It’s not simply about drawing up new plays and running them. Blocking schemes, position drills, terminology, adjustments vs. different defenses, ways to best use personnel and a million other little tweaks all must be learned, over years, usually through trial and error. Everything needs to fit into a coherent framework, with plays and adjustments for every possible defensive strategy built in or the scheme will eventually collapse as defenses learn how to stop an offense. I’ve wondered how so many teams, so quickly have been able to adopt the spread as it has come into prominence the past ten years. Yesterday I learned at least part of the answer. Tony Franklin, current offensive coordinator at Louisiana Tech markets a package of everything a coach would need to install the spread. Clinics, teaching progressions and a whole binder full of DVD’s is included, letting a coach learn this offense in a relatively short time. Stamford took to this system when they looked down their pipeline and saw the kids coming up would be a good fit for this scheme. It seems they made a good choice as the Bulldogs advanced to the State Championship in 2011 and are expected to make another run at the title this year. 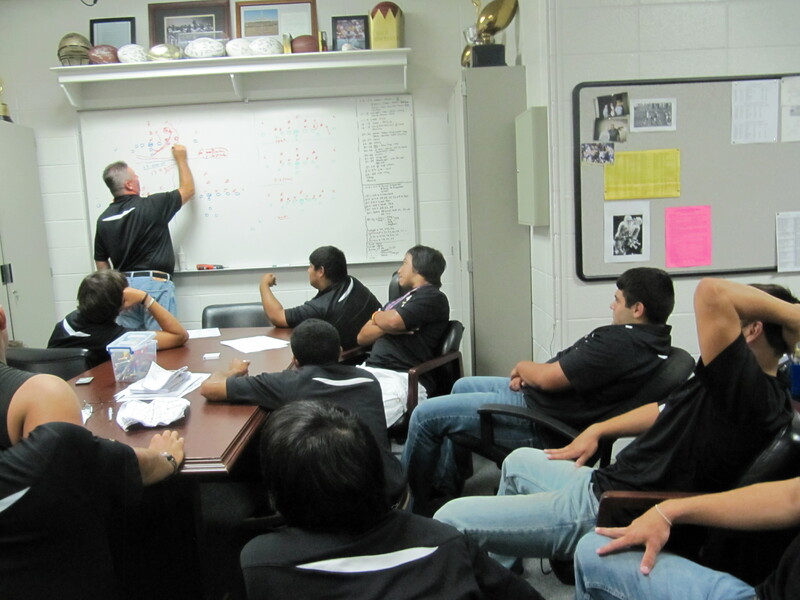 Sandcrab offense goes over adjustments with Coach Whitaker game-day morning. The Calhoun Sandcrabs were too much for an inexperienced Somerset team last night in Port Lavaca. The Sandcrabs led 35-6 at the half, en route to a 49-6 victory. For the second week in a row junior fullback Cory Williams had a huge game, rushing for 255 yards on 11 carries and 3 touchdowns. His 85 yard touchdown in the 3rd quarter was impressive. The run highlighted all three skills a great back needs; agility, speed and strength. Making a move after hitting the hole, running over a tackler before pulling away from pursuit with speed that isn’t supposed to exist in South Texas, Williams showed why he’s on the radar of D-I schools. Somerset is coached by Sonny Detmer, father of two NFL quarterbacks, Ty and Koy Detmer and grandfather of current Bulldog quarterback Koy Detmer Junior. I had the privilege of talking with Coach Detmer before the game and was struck by what a nice guy he is. I became more impressed with him after the game. The Calhoun option offense quickly adjusted to exploit every defensive adjustment the Bulldogs made, rushing for a total of 550 yards. The defense was impressive as well sacking Quarterback Koy Detmer, 5 times and holding an explosive offense to 6 points. Final score: 49-6 Calhoun Sandcrabs. More memorable than the game however was what happened afterwards. Instead of the typical handshake line you usually see following a high school game, the two teams gathered around Coaches Whitaker and Detmer for a prayer and then shook hands in a more sincere way than the normal routine allows. I have no doubt the scene would have been the same had the score been reversed. These are two classy coaches whose programs are reflections of the men at the helm. 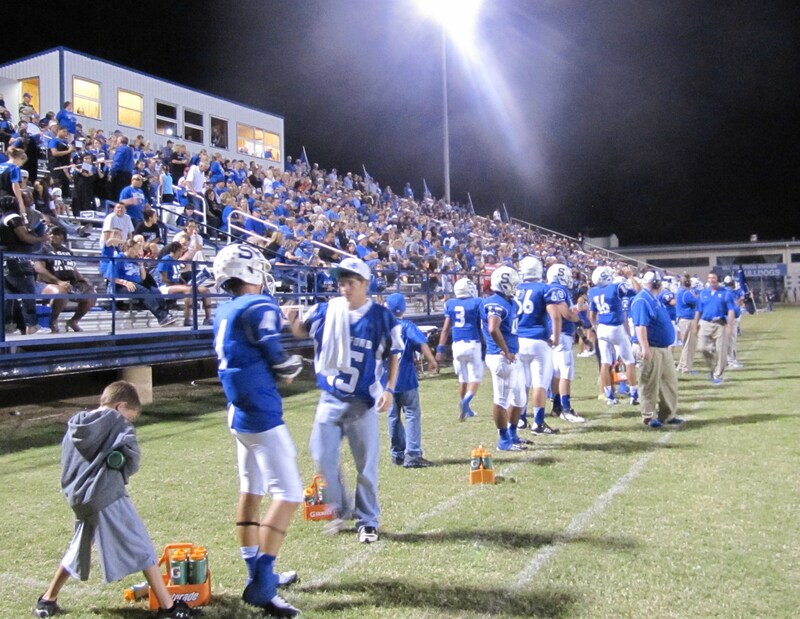 A major reason for this blog and the book I’m writing is to highlight what is good and right about high school football. 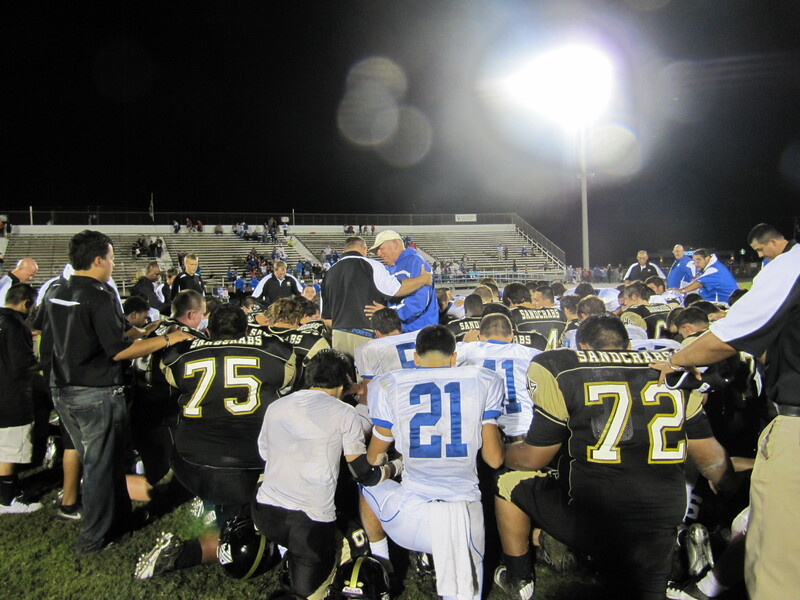 A scene like this doesn’t get the attention of a touchdown or big hit, but it is the true purpose of the game. The boys at Calhoun and Somerset will become better men because of what they learn through the process and from their coaches. Again, I want to thank everyone at Calhoun High School. They were great hosts, quality people and have built a program that Port Lavaca has rightly fallen in love with. The lower you go in football levels the more the game becomes about who the best player on the field is. If you ever see a pee wee game, you see 21 players cancelling each other out while the 22nd takes over the game. Most often it isn’t until you reach the high school, varsity level where you see teamwork and execution enough to overcome the best individual athlete on the field. For this reason last night’s freshmen game between Calhoun and Somerset was unusual. Somerset jumped out to a 22-0 lead, due to Calhoun mistakes, but also behind several players that looked better than any of the Sandcrabs appeared to be. The Sandcrabs came back and won in the final minutes 39-36. What won the game for the Crabs was the execution of their system and the kids working together. It was still a freshmen game, with a lot of unforced errors and sloppy play, but in the end execution overcame athleticism, and that’s a neat thing to see. I’m packing up at the Holiday Inn Express. It’s going to be a fun and interesting day with the homecoming festivities and hopefully, a well-played game against Somerset and then a long drive to Stamford after the game ends. After a week with a team, you have a definite rooting interest in the team you’re covering. So tonight, I’ll be checking the scores from Carthage and La Marque as well as pulling for the Sandcrabs. Hopefully they will do what their freshmen team did last night and out execute Stamford. I made a mistake in my last post about the Calhoun offense. A coach told me that the offense uses two types of blocking, rule and zone. I wrote that the Sandcrabs use only two blocking schemes thinking it to be the case. The next day, Coach Whitaker let me know they actually use five rule schemes and one zone scheme for a total of six. I guess its a danger of drawing too many conclusions about a program after only one day. It’s especially embarrassing, because it’s an oversight I should never had made, having spent 22 years coaching the offensive line. To better explain; Rule blocking gives every linemen a rule that lets them determine who to block on a particular play. For example, a right guard might have a progression of on, over, near backer as a rule, telling him his first priority to to block a down linemen in front of him, if there isn’t one, block someone in front of him and off the ball (usually a linebacker), if that isn’t there he will block the closest linebacker to the play. Zone blocking gives every linemen a zone to block where they are responsible to move anything that comes into it and usually involves adjacent linemen working together to get push on a down linemen. Six schemes are actually quite a few and this undercuts the simplicity case I tried to make in the previous post. When it comes to the offensive line at Calhoun, there is nothing simple about what they do. I’ve always believed offensive linemen to be the smartest players on the field and studies back this up. The Sandcrab offense is so focused on running the ball that a huge part of their recent success is directly due to the offensive line and I’ve been very impressed with them on film and in the last three days of practice. How well CHS does this year will have a lot to do with how this inexperienced unit (4 1st year starters) plays. So far they have been very effective. Below is a comment I recieved and the explanation of another reference from my last post. I mentioned HUDL several times, but haven’t explained what it is. Great post, coach. I’ve never heard of HUDL and, the more I think about it, I have no idea how high school coaches shoot a game. I know they watch a boatload of game film but never considered the source. So here’s a few questions: 1) How many cameras are typically used to cover a game? 2) Where are they deployed? and 3) How is game film exchanged between teams? No doubt the internet has made all the video tech more accessible. I’m sure they’re not shooting grainy Super8 and splicing with an exacto like they did back in the day. HUDL is the relatively new scouting software that the last few years has basically monopolized the market by buying up its competition. Its internet based, so coaches can access their film from any place they have an internet connection. Coaches use it to organize game and practice film (intercut the three angles), trade film with other coaches, breakdown all the details of a play (down/distance,,formation, play,,,etc) and finally to look at tendencies they might use in gameplans. Most teams in Texas use three cameras; 2 sideline (wide & tight) and an endzone shot. Teams used to trade film, then VHS tapes, then DVD’s by meeting parking lots on Saturday morning. Now everybody uploads it to HUDL, then allow the other team to download it. Much better method for teams who are far away from each other. Where I’m from we would trade only wide shot film,, in Texas the standard seems to be trading wide and tight shots, nobody trades endzone shots, that angle gives so much info. about linesplits, defensive alignments and blocking schemes, things that coaches don’t really like to give so easily. Great week so far in Port Lavaca. I’ve learned a lot about the history, the turnaround and what the rise of the Sandcrabs has meant to the school and community of Port Lavaca. All three weeks of the regular season I’ve reached a tipping point where I know I had enough of the story to write a competent chapter for my book. I reached that point yesterday after a great interview with local contractor Randy Boyd. I want to thank Mr. Boyd, Mark Howell, Stephan Phillips, Lina Moore and the coaches and administrators at Calhoun for giving me some of their time. Tomorrow: 2 freshmen games and Friday the big homecoming game against Somerset. It’s going to be a lot of fun.